Examples of some basic refinish paint jobs. 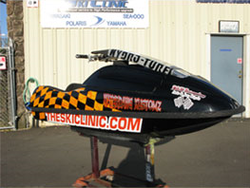 We can help bring your Watercraft appearance back to life at The Ski Clinic. 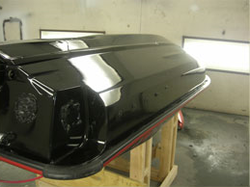 From Stock refinish to color changes, we can make it happen using quality paint product. 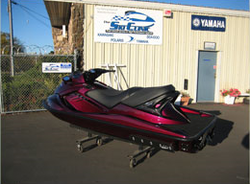 If you are looking for a more than basic refinish job, from mild to wild, we can help at The Ski Clinic. 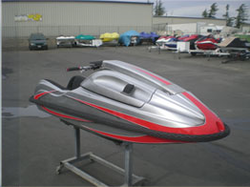 Let us help you in adding some flavor to your watercraft. In addition to paint refinish and paint design, we also work with Graphic Kits. 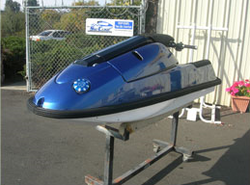 They are a simple and easy way to change the appearance of your watercraft with endless options in designs as well. All graphic kits and decals are made in house. 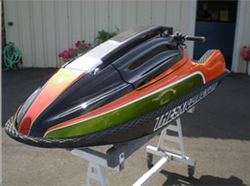 Is the bottom of your PWC/ Watercraft not looking like it did when it was new? No problem, we can help. At The Ski Clinic we can get that bottom looking as good as new again! 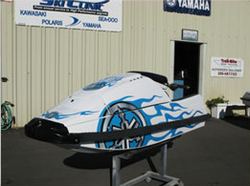 With custom lettering, you can add that personal touch, from Custom Registration numbers to displaying your name. All work is hand painted and is sure to set your craft apart from the others.